It is that time of the year when we start doing a lot of grilling. Rex loves to use the grill and I love that he does the cooking. I am always on the look out for new sauces or marinades. This past weekend we had some steak on the grill and I tried these yummy sauces from SAAS. There are two different ones. The first one in the picture is the “Onion & Garlic” which is my favorite. Has lots of flavor and tasted great. Only the freshest onions combined with garlic, honey, and orange habaneros are used. The second one pictured is the “Original Flavor” An amazing mix of fresh red jalapeños, orange habaneros, and spices gives this sauce a rich, fresh red pepper flavor with a complex and refined bouquet that always compliments any food it may be served with. Joey liked that one the best – matter of fact he uses it a lot! 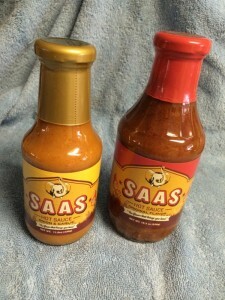 What is so unique about the sauce is that in 2008 a group of students were brainstorming to with ideas on how to make money for good causes – and the SAAS “Orginal Flavor” was born! Now there are two delicious quality product both generate money for charitable donations. If you would like to purchase your own great tasting SAAS sauces HERE. You can stay connected on Facebook.